Manchester United star Jesse Lingard has explained the improvement in form of midfielder Paul Pogba in recent games. There’s no denying the France international has looked a player reborn under Ole Gunnar Solskjaer, who was recently named interim manager until the end of the season following Jose Mourinho’s exit. 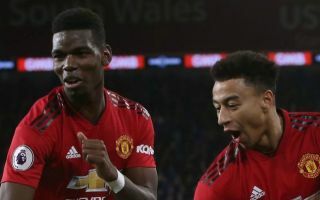 Lingard admits United are now seeing the best of Pogba, who has been a star performer for the Red Devils in their three wins from three matches under Solskjaer. Discussing the rapid improvement of his team-mate, the England international explained that it’s partly down to his role in the team, and partly due to the new boss giving him the confidence to play his game. ‘I can definitely, definitely, see the Paul I used to know,’ Lingard is quoted in the Guardian. ‘I have seen him playing through the ranks and he is back to that player, the player we know. ‘Paul’s enjoying his football. He’s playing in the role he likes to play in just inside, off the left. He has the freedom to make things happen. He has always got forward in that position and scored goals. This could undoubtedly be taken as a bit of a dig at Mourinho, under whom Pogba never really looked like the world class midfielder we saw at Juventus, or for France in their World Cup-winning campaign last summer.